Indicated for pediatric (from 11 lbs / 5 kg) and adult patients, the Vivo 65 effectively treats a broad range of respiratory diseases while providing ease of use to medical staff and care givers. To provide continuous or intermittent ventilatory support for the care of individuals who require mechanical ventilation. The Vivo 65 with the SpO2 sensor is intended to measure functional oxygen saturation of arterial hemoglobin (%SpO2) and pulse rate. The Vivo 65 with the CO2 sensor is intended to measure CO2 in the inspiratory and expiratory gas. The device is intended to be used in home, institution, hospitals and portable applications such as wheelchairs and gurneys. It may be used for both invasive and non-invasive ventilation. It is currently only available in the United States. 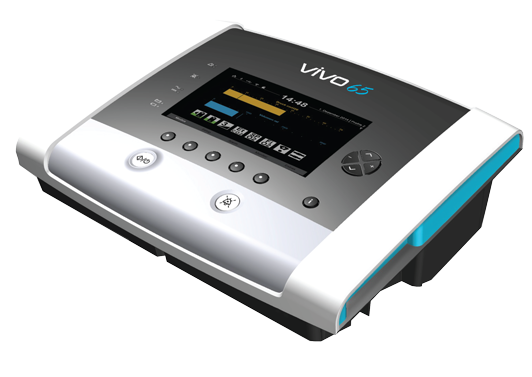 The Vivo 65 is the latest ventilator of Breas Medical for use in the hospital, post-acute care institutions and the home. Vivo 65 has been developed with the needs of professional caregivers and patients in mind: to provide highly effective and comfortable treatment and to help avoid readmissions to the hospital. Vivo 65 is an ideal choice for treatment of children (> 11 lbs / 5 kg) thanks to its accurate volume delivery and highly responsive trigger system. With its intuitive user interface, the Vivo 65 is easy-to-use and easy-to-teach. • Integrated monitoring of SpO2, FiO2 and CO2 helps reduce the need for external monitoring devices and reduce cost. • CO2 monitoring is quick and easy to use, does not require calibration and provides increased insight into the quality of ventilation. The Vivo 65 brings advanced monitoring capabilities providing detailed insight in the quality of ventilation. Alarms: High Pressure, Low Pressure, High PEEP, Low PEEP, High Vte/Vti , Low Vte/Vti , High MVe/MVi, Low MVe/MVi, High Breath Rate, Low Breath Rate, Apnea, Disconnection, Rebreathing, High FiO2, Low FiO2, High SpO2, Low SpO2, High EtCO2, Low EtCO2, High InspCO2, High Pulse Rate, Low Pulse Rate, Low Last Power Source, Obstruction. We would be happy to send you more information on the Vivo 65. Please fill out the form below and our sales team will get in touch with you. Once you submit this form we will be in touch shortly to schedule a visit. thank you.